What? 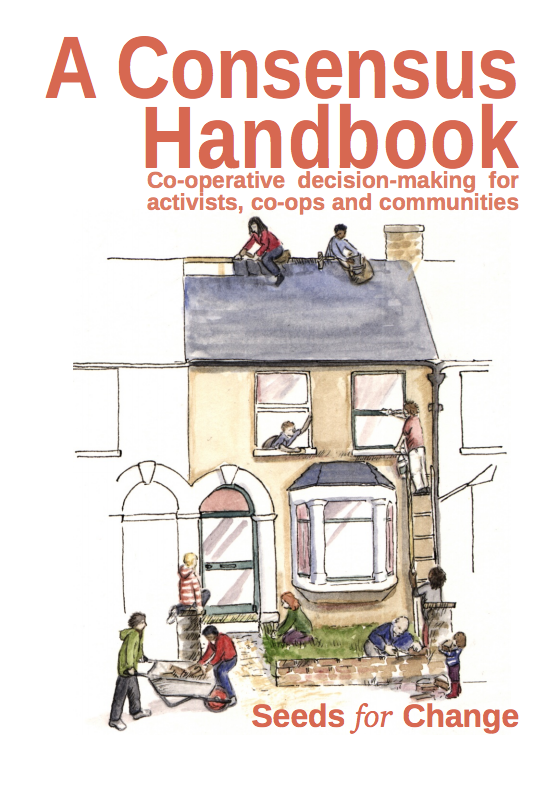 A Consensus Handbook is a manual created by the UK Social Justice and Environmental Activism Worker Co-op, Seeds for Change, that provides tools and techniques for cooperative decision making processes. The manual includes methods for troubleshooting obstacles and addressing conflict as well as a guide for facilitating consensus practices in workshops and skillshares. Why? Consensus building is a strategy used as an alternative to voting and representative democracy processes that ensures all members of a community have a voice in shaping the decisions which impact them. Participants in group consensus practices stay engaged in the decision making process and feel confident that everyone’s perspective is taken into account. This process can counter existing power inequities in order to provide all participants with an equal voice in determining the outcome of their community.